On Sunday, Super Bowl XLVI will be played in Indianapolis's Lucas Oil Stadium. In addition to watching the biggest game of the year, the more than 70,000 fans in attendance and the millions viewing at home will see numerous advertisements and promotions. The NFL, obviously, will decide what fans see. Companies will pay the NFL for that privilege and they will want it to be as exclusive as possible. Less obviously, the NFL will decide what fans see outside the stadium, possibly even miles away from it and on public streets. That is because of Prop 188, which was approved by council members of the City of Indianapolis and Marion County and which authorizes "clean zones" in the stadium's vicinity. In these zones, those who wish to advertise or promote commercial activity in any way connected to the Super Bowl -- whether it be selling football themed T-shirts, memorabilia, snacks or advertising those items through banners, signs, building wraps, electronic and mobile messages, inflatable soda bottles and beer cans etc. -- must first receive approval from the NFL and obtain from the government a "limited duration license," which in most cases costs $75. Clean zones not only impact a vendor who shows up on the day of the Super Bowl and then leaves town. Even long-standing restaurants and retail stores, provided they are located within a clean zone, will need permission from the NFL to capitalize on the Super Bowl in their signage and advertising. Local authorities will enforce the clean zones and violators can be fined hundreds of dollars as well as have their items seized and impounded. Clean zones are not new. Municipalities hosting recent Super Bowls have adopted them as an NFL requirement for hosting the game. In 2006, Detroit adopted a 300-mile clean zone for Super Bowl XL. Last year, the City of Arlington, Texas, instituted a one-mile zone for Super Bowl XLV; if Arlington had failed to pass a clean zone ordinance, the local host committee was obligated to pay the league $1 million. Clean zones have also been adopted for other major sporting events, including the 2002 Winter Olympics in Salt Lake City, NCAA tournament games and the College World Series. The Indianapolis clean zone ordinance, which now governs all large sporting events in the city (including the Big Ten Football Championship game that was played on Dec. 3), is distinguishable because of its scope and flexibility. It is apparently the first ordinance to authorize the creation of multiple clean zones and of adjustable radius. Specifically, an Indianapolis official -- the "license administrator" -- decides where and how expansively to lay the zones. The NFL could conceivably hold significant control over commercial activity in most of Indianapolis's downtown area during Super Bowl XLVI. Clean zones raise a number of questions. Should communities hosting Super Bowls effectively grant the NFL commercial and speech power over other businesses, including those that have been local fixtures for decades? Are clean zones cooperative efforts or government capitulations? Could they be enforced in ways that involve uneasy entwinements of police and NFL-hired private security? Advocates of clean zones insist they provide substantial benefits to those attending games and to local communities. For one, clean zones curb "ambush marketing," also known as "parasite sponsoring." In the absence of clean zones, companies that lack sponsorships with the NFL might try to confuse Super Bowl attendees into believing the NFL has approved them as corporate partners. As a result, consumers could be duped into paying top dollar for counterfeit and inferior "NFL" merchandise. Alternatively, consumers might trust that a particular food vendor has been approved by the NFL, when in fact no such approval occurred. Clean zones thus raise the reliability and authenticity of commercial activities around the Super Bowl. Companies that pay to enjoy a relationship with the NFL are also protected by clean zones. Those companies would be harmed if ambush marketers could trick consumers into believing they too are official sponsors. Along those lines, the economic value of an official relationship with the league would suffer if an unofficial or unauthorized relationship furnished the same benefits. The NFL would in turn command less money for official relationships, meaning less money would be distributed to teams and players. Companies that pay for an official relationship also pay for exclusivity in reaching consumers. In a clean zone, competition is restricted to those businesses legally authorized to sell and advertise. Ambush marketers are thus denied the chance to free ride off the NFL's name, offer lower prices and "steal" away customers. Clean zones also empower the NFL to control the intensity and appropriateness of commercial activities. The league does not want Super Bowl goers to experience a bombardment of visuals and words, especially those that are offensive or inappropriate. By requiring its permission to advertise in a clean zone, the NFL can reject less reputable promoters. Lastly, clean zones may provide a safer experience for Super Bowl attendees. A reduction in the sheer number of promoters means more physical space for those in attendance and better access for law enforcement to ensure safety. Clean zones raise a bevy of concerns. For one, clean zones unabashedly limit competition when businesses are denied permission from the league or city. A decrease in competition implicates two core worries of antitrust law: fewer choices and higher prices for consumers. So perhaps instead of two dozen T-shirt street vendors around Lucas Oil Stadium, the NFL only grants permission to a handful. Although they would still compete with vendors of other items, the licensed vendors might charge more and offer less variety. Second, clean zones restrict commercial speech, meaning speech that solicits a commercial transaction, such as when a company advertises or promotes a product. To be sure, commercial speech is accorded much less protection under the law than political speech. While the First Amendment aggressively protects one's right to express personal opinions from government suppression, a government, such as the City of Indianapolis, can readily limit commercial speech that is deceptive and misleading. Not all the commercial speech impacted by a clean zone may be deceptive or misleading. Otherwise legitimate vendors may simply want to promote their goods, on public streets, without paying for a license. To restrict the commercial speech of these vendors, the clean zone will need to directly advance an important governmental interest (for example, public health or safety) and it cannot be more restrictive than necessary. The expansiveness of the Indianapolis clean zone ordinance -- which could lead to multiple clean zones of any size in the vicinity of the Super Bowl -- suggests that it may be unnecessarily broad. Third, clean zones may undermine a key rationale for a city hosting a Super Bowl: to generate money for local businesses. 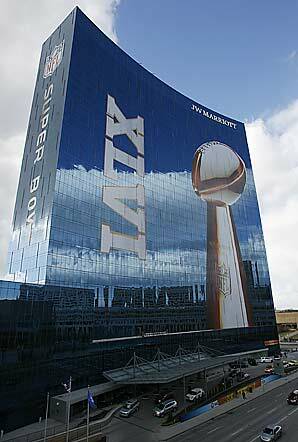 The Super Bowl is the biggest sporting event of the year and attracts multinational corporations to advertise. Local companies, in contrast, could risk denial by the NFL for permission to connect their business to the game, especially if those local companies sell items that compete with items sold by official sponsors. Fourth, clean zones raise questions of entanglement, particularly in terms of how clean zones arise and their implementation and enforcement. If the NFL selects a city to host a Super Bowl, that city must pass a clean zone or it will be obligated to pay the NFL a substantial fee. While there is nothing illegal about the NFL yielding its power or a local government determining that landing a Super Bowl is worth meeting the NFL's demands, the idea that a professional sports league can effectively "force" a government body into passing a law is disquieting. Then there are issues of implementation and enforcement. In last year's Super Bowl XLV, the league and local Arlington authorities coordinated on implementation of a clean zone ordinance. The league also hired private security officers to enforce the ordinance. These officers assigned tickets to violators, who, though only fined, had technically committed a misdemeanor criminal offense. Should the NFL's private police have "jurisdiction" over anyone, especially those outside of football stadiums? Fifth, clean zones may be unnecessary. Existing laws already prohibit the sale of counterfeit goods and deceptive marketing practices. The federal Trademark Counterfeiting Act of 1984 and the Anticounterfeiting Consumer Protection Act of 1996, for instance, ban the transportation and sale of counterfeit goods, with violators subject to millions of dollars in fines and decades in prison. The federal Lanham Act bans false and misleading advertising. Indiana and the City of Indianapolis, for their part, provide their own laws designed to address the same underlying problems. While clean zones furnish added and event-specific protection, they may be undesirable on balance when weighing their drawbacks. Last year anti-bullying advocate Eric Williams teamed up with Best Buy on what seemed like a promising idea: Williams would park his bus in Best Buy's parking lot near Cowboys Stadium between Feb. 4 and Feb. 6 and host a John Madden video game tournament. Williams would charge participants of the tournament, which would teach children about how to detect and stop bullying. Arlington police and code enforcement officers asked Williams if he had a permit to be there. He did not and saw no reason why he should. After all, his bus was on Best Buy's private property, with the store's express invitation. The security officers nonetheless insisted that Williams move the bus, since it was a commercial operation located within a clean zone ordinance. Williams refused to leave and was ticketed as an ambusher marketer. Police officers arrived soon thereafter and, allegedly with hands on their guns and sirens and lights blaring, informed Williams that he would be arrested if he didn't leave. Although highly embarrassed and offended, Williams left. With the help of Dallas attorneys Jonathan Winocour and Corinna Chandler, Williams is in the midst of a litigation against the NFL, the City of Arlington and other parties connected to Super Bowl XLV over the constitutionality of the clean zone ordinance and the so-called "pervasive entwinement" of its implementation and enforcement. Williams, who is African-American, also maintains his civil rights were violated. Most of the persons charged as ambush marketers were either African-American or Hispanic, all were persons rather than businesses (Best Buy interestingly was not ticketed) and Williams insists that his bus was targeted for expulsion because of its images of African-Americans. The league categorically rejects the accusations. It also maintains that it is immune from liability because of the Noerr-Pennington doctrine, a powerful doctrine that protects the right of persons (including businesses like the NFL) to lobby for passage of laws. Even if the Arlington clean zone ordinance is deemed unconstitutional, the NFL believes it should escape responsibility. The doctrine is premised on the idea that persons should be able to petition for laws without later being exposed to liability because of their petitioning. Put another way, if you could later get sued for trying to get a law passed, you wouldn't try to get that law passed and your First Amendment rights, along with the general fabric of our democracy, would be harmed. Williams's case has moved pass a motion to dismiss and is headed for trial before U.S. District Judge Terry Means in Fort Worth in May. Should the parties fail to reach a settlement, a trial could provide a landmark test case on the legality of clean zone ordinances.